Remember the compass card I posted a few days ago? Here's a different design in which I used the same "found" paper. The patterned background was originally the cover of a contemporary art museum catalog that caught my eye when it arrived in the mail. Because I loved the colors and its textured vibe, I couldn't bear the thought of banishing it to the recycling bin. So out came the trimmer and a short while later... big rectangle, torn edge, little squares, some added triangles, and bam!... a surface ready for coils and scrolls. The strips for the filigree design were cut from interesting speckled paper that started life as a theater program. 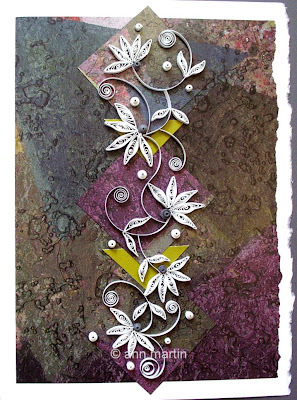 A random quilled design like this one is easier to do than it appears at first glance because there's really no right or wrong way to position the elements. Trust yourself to go with the flow as you glue each piece in place and I'm pretty certain you'll be happy with the result. Thanks very much! Good to know there's another papercraft maven here in Delaware. Your projects are so unique and inspiring. I like all of them. Thank you for sharing the magic! Beautiful card! How great that you can see the potential waiting in a program.